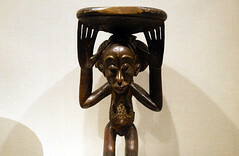 Seated Figure, terracotta, 13th century, Mali, Inland Niger Delta region, Djenné peoples, 25/4 x 29.9 cm (The Metropolitan Museum of Art), 82nd & Fifth: “Bundle of Emotions” by Yaëlle Biro. 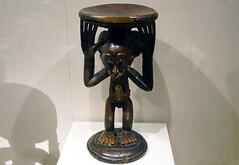 Among the earliest known examples of art from sub-Saharan Africa are terracotta figures like this one from the inland delta of the Niger River, near the present-day home of the Dogon and Bamana peoples. In this region of Mali, the ancient city of Jenne-jeno (“Old Jenne”) flourished as a center for agriculture, trade, and art from the middle of the first millennium until about 1600. 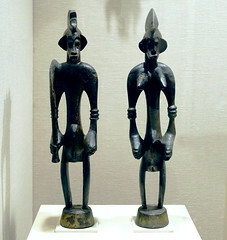 The terracotta figures associated with this civilization represent men and women, singular and in pairs, in a variety of attire and poses, including sitting, kneeling, and on horseback. The diversity of imagery and the skill with which they were modeled reveal the rich sculptural heritage of a sophisticated urban culture. This figure sits, hunched over, with both arms clasping an upraised leg, its head tilted sideways to rest against its bent knee. The posture evokes a pensive attitude that is reinforced by the expressiveness of the facial features: the bulging eyes, large ears, and protruding mouth are all stylistically characteristic of works from this region. The fluid contours of the body emphasize the long sweeping curve of the neck and back and the rhythmic play of intertwined limbs. Except for the barest suggestion of shoulder blades, fingers, and toes, the figure lacks anatomical details. On the back are three rows of raised marks and two rows of marks punched into the clay. These have been variously interpreted as scarification marks or symptoms of a disease. Thermoluminescence tests indicate that this figure was fired during the first half of the thirteenth century. 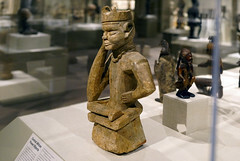 Other terracotta figures recovered (and, in many cases, looted) from various sites throughout the Inland Niger Delta have been dated from the thirteenth to the sixteenth century. Artists—either men or women—modeled the figures by hand, using clay mixed with grog (crushed potsherds). Details of dress, jewelry, and body ornament were either added on or incised. Once complete, the work was polished, covered with a reddish-toned clay slip, and then fired, probably in an open-pit kiln. The surviving figures vary in style and subject matter, suggesting that the sculptors had considerable artistic freedom. Our understanding of the use and meaning of such works remains speculative. A few controlled archaeological digs have revealed similar figures that were originally set into the walls of houses. Oral history collected recently in the region supports the archaeological evidence, as the figures are said to have been venerated in special sanctuaries and private homes. There is little consensus, however, on the meaning of the various forms of the terracotta figures. Scholars have suggested that this figure conveys an attitude of mourning. Its seated pose, shaved head, and lack of dress recall mourning customs still practiced by some in this region of western Africa. Explore this object—360 view, from The Metropolitan Museum of Art. Cite this page as: Dr. Christa Clarke, "Seated Figure (Djenné peoples)," in Smarthistory, September 23, 2016, accessed April 22, 2019, https://smarthistory.org/seated-figure/.